Azarga Metals Samples 21 Meters Of | Azarga Metals Corp.
AZARGA METALS CORP. ("Azarga Metals" or the “Company”) (TSX-V:AZR) announces assay results from surface channel samples of outcropping mineralization and diamond core drill-holes from its Unkur Copper-Silver Project in the Zabaikalsky administrative region of eastern Russia. The Company has now completed field activities for its first phase exploration program. In addition to the assays covered in this press release, additional data is still pending for the trenching program. Azarga Metals has engaged SRK Consulting (Russia) Ltd. to prepare a maiden NI 43-101 Resource estimate at Unkur, which is expected to be completed late in Q1 or early in Q2 of 2017. Channel samples from each of two surface outcrops located about 800 meters apart from each other assayed 21 meters at 39.6g/t silver and 0.81% copper (ie, 126.2g/t silver equivalent or 1.18% copper equivalent) and four meters at 5.2g/t silver and 0.41% copper (ie, 49.0g/t silver equivalent or 0.46% copper equivalent), respectively. These outcrops add approximately 200 meters of potential up-dip extension to silver-copper mineralization delineated by drilling. Drill-hole AM-020: 10 meters at 37.6g/t silver and 0.67% copper (ie, 109.2g/t silver equivalent or 1.02% copper equivalent) from 229.0 meters to 239.0 meters, including four meters at 81.9g/t silver and 1.50% copper (ie, 242.3g/t silver equivalent or 2.27% copper equivalent) from 235.0 meters to 239.0 meters. Drill-hole AM-002: 38 meters at 13.1g/t silver and 0.32% copper (ie, 47.3g/t silver equivalent or 0.44% copper equivalent) from 434.5 meters to 472.5 meters. 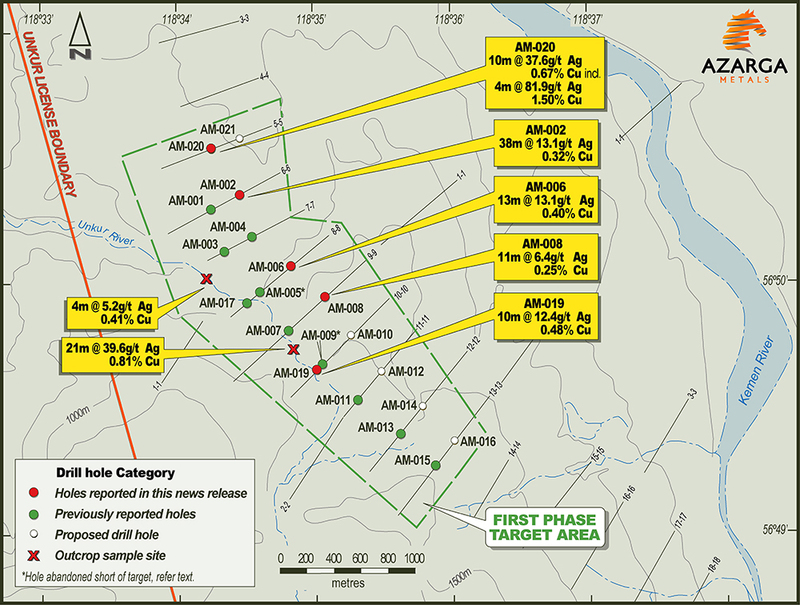 Drill-hole AM-019: 10 meters at 12.4g/t silver and 0.48% copper (ie, 63.6g/t silver equivalent or 0.60% copper equivalent) from 39.0 meters to 49.0 meters. Drill-hole AM-006: 13 meters at 13.1g/t silver and 0.40% copper (ie, 55.9g/t silver equivalent or 0.52% copper equivalent) from 443.5 to 456.5 meters. Drill-hole AM-008: 11 meters at 6.4g/t silver and 0.25% copper (ie, 33.1g/t silver equivalent or 0.31% copper equivalent) from 352.3 meters to 363.3 meters. Note: copper and silver equivalencies have been calculated using US$17.89/oz silver price and US$2.79/lb copper price and assuming 100% recoveries. Note: drill intercepts are reported as drilled and may not be representative of true widths. Drill holes have been sited to attempt to intersect mineralization as close to perpendicular as possible, but there is not sufficient information about geometry of the mineralization at this time to estimate true widths. A Quality Assurance / Quality Control program is part of the sampling program on the Unkur prospect. This program includes chain of custody protocols as well as systematic submittals of standards, duplicates and blank samples into the flow of samples produced by the sampling including check assays of approximately 10% of the samples by another certified laboratory. Samples were analyzed at SGS Vostok Limited in Chita, Russia. Check assays will be analyzed at ALS Geochemistry in Chita, Russia. Azarga Metals has drilled approximately 4,600 meters at its Unkur Copper-Silver Project as per the table below. The table does not include abandoned holes. Notes: = full reported intersection and = sub-section of the relevant full reported intersection. Drill-holes AM-005 and AM-009 did not intersect mineralization of significance. Hole AM-010 was not drilled. Azarga Metals owns 60% of the Unkur Copper-Silver Project along with the right to acquire the remaining 40% in the future. Sediment-hosted copper and silver mineralization has been identified across the 5,390 hectare project license area, in outcrops, trenches and by historical diamond drilling. The prior exploration outlined a large area of high-grade shallow stratiform sediment hosted copper-silver 20 to 50 meters thick over an area four to six kilometers long. Further details concerning Unkur Copper-Silver Project are contained in a technical report filed by the Company as per its news release of 5 April 2016. The Company’s President and Chief Executive Officer, Dorian L. (Dusty) Nicol, B.Sc. Geo, MA Geo, a Qualified Person as defined by NI 43-101, has reviewed and approved the exploration information disclosures contained in this Press Release. Azarga Metals is a mineral exploration and development company that owns 60% of the Unkur Copper-Silver Project in the Zabaikalsky province in eastern Russia. For further information please contact: Doris Meyer, at +1 604 536-2711 ext 6, or visit www.azargametals.com. This news release contains forward-looking statements that are based on the Corporation's current expectations and estimates. Forward-looking statements are frequently characterized by words such as "plan", "expect", "project", "intend", "believe", "anticipate", "estimate", "suggest", "indicate" and other similar words or statements that certain events or conditions "may" or "will" occur. Such forward-looking statements involve known and unknown risks, uncertainties and other factors that could cause actual events or results to differ materially from estimated or anticipated events or results implied or expressed in such forward-looking statements. Such factors include, among others: the actual results of current planned exploration activities; conclusions of economic evaluations; changes in project parameters as plans to continue to be refined; possible variations in ore grade or recovery rates; accidents, labour disputes and other risks of the mining industry; delays in obtaining governmental approvals or financing; and fluctuations in metal prices. There may be other factors that cause actions, events or results not to be as anticipated, estimated or intended. Any forward-looking statement speaks only as of the date on which it is made and, except as may be required by applicable securities laws, the Corporation disclaims any intent or obligation to update any forward-looking statement, whether as a result of new information, future events or results or otherwise. Forward-looking statements are not guarantees of future performance and accordingly undue reliance should not be put on such statements due to the inherent uncertainty therein.